Hackney PlayBus is a fully converted double decker bus that is taken to estates and parks, Children's Centres and other venues in and around East London. Parents and their children under 5 years old are welcome to join the PlayBus for Music and Movement and Messy Play sessions. Hackney PlayBus has been providing free play and support for families in East London for over 40 years. New parents with children under 1 years old can find support, friendly advice and a cup of tea at our Rollers and Crawlers sessions. We encourage outdoor play in all weathers by providing a wide range of outdoor toys and shelter when the weather requires it. The term time PlayBus sessions are perfect for children aged 0-5 years old and their parents. During school holidays children 8 years and under are welcome. 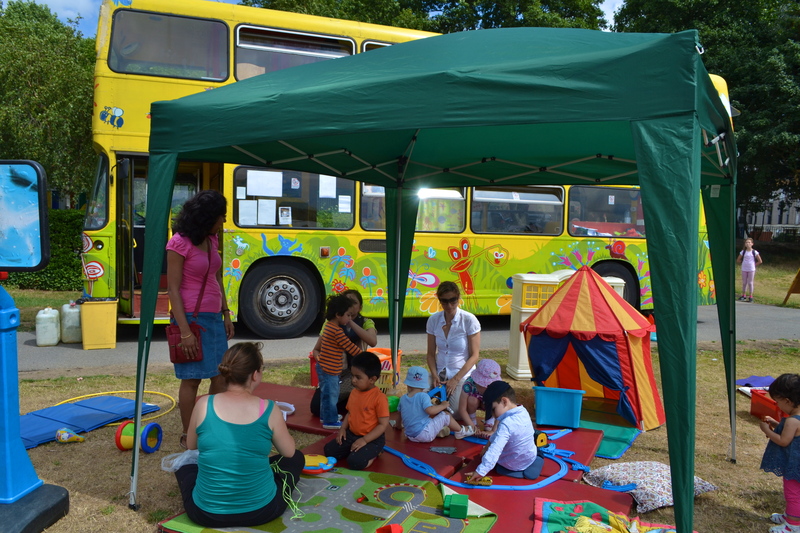 There are regular free PlayBus sessions in Hackney. This is a mobile service that travels around the borough. Please see their website for their timetable to find out when they will be in your area or to find out about sessions you would like to attend. The PlayBus has trained, experienced and police checked staff who can be booked for crèches. If you are looking to book a crèche, please get in contact with the service to discuss your requirements.